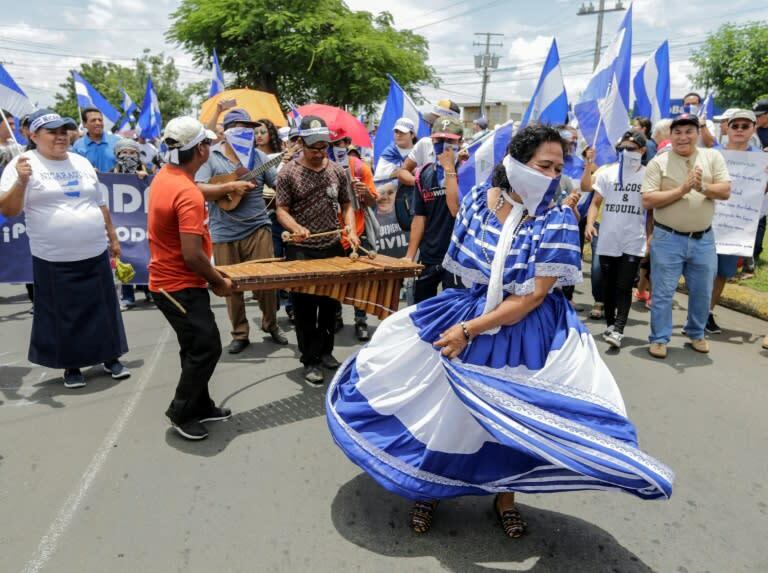 Thousands of Nicaraguans marched through their capital on Wednesday demanding that anti-government protesters jailed over the past four months be released. "Liberty for our political prisoners," yelled many in the rally. They also called for President Daniel Ortega, a 72-year-old former guerrilla who has been in power the last 11 years, to step down. The demonstration was a show of defiance over a law passed last month that threatens protesters with terrorism charges carrying up to 20 years behind bars. The law is part of robust crackdown Ortega has employed to try to snuff out the protests that have been rocking Nicaragua since mid-April. Violent actions by police and armed paramilitaries have contributed to a death toll that rights groups put at more than 300. Ortega's government has jailed around 500 people in relation to the tide of anti-government sentiment, and has put on trial 180 of them for alleged terrorism and other serious crimes, according to the Nicaraguan Center for Human Rights. "They've locked up many people with no justification. The government has no argument to lock up civilians for the crimes of expressing what they feel," said one marcher taking part on Wednesday, Tania Gonzalez, 26. The demonstration was organized by the Civic Alliance, a grouping of unions, business groups, students and others that has emerged out of the protests. It coincided with the start of a trial of a rural opposition leader, Medardo Mairena, a member of the Civic Alliance who was part of Church-mediated talks with the government that have stalled since June. Ortega accuses those agitating against him of terrorism and serving a US-backed "coup" against his rule. His wife and vice president, Rosario Murillo, has warned that the protest leaders "will pay for their crimes."